comments: What is the best way to hit a sure fire draw? Full shoulder turn, slightly inside the target line in regard to swing path, feel like you “pinch” your elbows together at contact and full finish. I live in: Maysville, Ky. When you practice, alternate hitting shots with a 7 wood then a drive, 7 wood then a driver, etc. Try to eliminate the mental block with the driver as it is obvious you make a forced swing with it due to lack of confidence. You should make sure you use a fairly lofted driver as well. 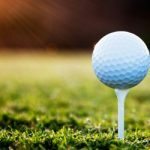 comments: I am doing an essay on golf and want to know a few things about the game. What is a slice? Why do you enjoy the game? What club are you a pro at? Have you played with any top named players? My husband & I attend the Nike Dominion Open in Richmond, Va and have been to Kingsmill. Thanks in advance. cathy l.
Slice is when the ball curves severely to the right for a right handed golfer. I enjoy the game for lots of different reasons; nature, the challenge, etc. I am the professional at Keeton Park GC in Dallas, Texas. Have played with Wayne Levi, Joey Sindelar, Mike Hulbert, DA Weibring to name a few. Thanks for your note. comments: I HIT EVERY CLUB IN THE BAG GREAT ON THE PRACTICE TEE BUT FAIL ON THE COURSE – WHAT DO YOU THINK IS MY PROBLEM? Similar problem is experienced by many of us. We try too hard and do not allow our selves to swing from feel. We get on the course and anticipate results, instead of staying out of our “head”. Focus on a good finish position instead of the swing itself or a possible result of the shot. Good luck! I live in: Houston, TX, U.S.A.
comments: I’ve been know to take mulligans here and there. Do you think mulligans are okay when you are a beginner, or should you start without ever taking them, because they could hurt you later? Depends on the nature of the round you are playing. If you are playing for practice and you can keep up the pace of play, ok. I would suggest hitting the 2nd ball, but playing the original ball. Sounds like your hands are too active, regardless of positions. Focus on turning the big muscles, the arms to follow the lead of those big muscles, and the hands to be “quiet” or still on the club. You will need to first find a position full time in an approved position as an assistant professional, etc. 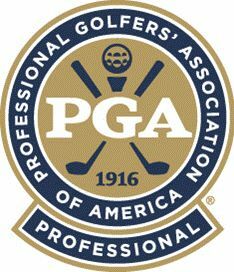 You then enroll with the PGA Apprentice Program AFTER passing the Playing Ability Test and attending the Professional Readiness Orientation. You must have worked full time in an eligible position for at least 6 months before enrolling in the apprentice program. The Golf Professional Training Program takes a minimum of 3 years but a maximum of 6 years to complete and you must be working full time. Contact the NTPGA for details at (972)881-GOLF. Good luck to you. comments: I HAVE PLAYING GOLF NOW FOR ABOUT 27 YEARS AND HAVE NEVER BEEN ABLE TO GET RID OF THAT AWFUL SLICE. MINE IS MORE OF A FADE. HOW CAN I GET RID OF THIS? IF I CAN DO THIS, I THINK I CAN BREAK THAT 80 MARK. Full shoulder turn, proper shoulder alignment prior to the swing (most of us tend to leave our shoulders open at address), leave our elbows close together throughout the swing in order to get the appropriate feel of “releasing” the club on the downswing. The slice or fade is caused by a swing path that is across the target line with the clubface being open (or to the right) at impact. comments: I’m starting to get good distance and I feel like this is the year I breakthrough. How can I take my game to the next level and shoot more consistently. I need to learn to focus and concentrate more, can you suggest ways for me to practice this? Pick out specific distance targets when you practice in addition to directional targets. Visualize playing a certain hole when you hit balls. Hit the drive and then the resulting 2nd shot, etc. Quality practice requires some imagination. 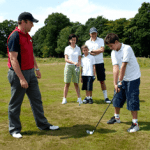 Try to make your practice sessions assimilate conditions that you encounter when you play. I live in: St. Louis , Mo. U.S.
comments: I tend to struggling with my driver. Sometimes I will hit the ball perfectly straight but other times I tend to hook it or leave it right. I also tend to have a problem adressing the ball, I take along time to get comfortable on the tee. What might I do to get over this. Also on the tee at par three’s is it good to not use a tee or should I use a tee all the time on the tee’s? Use the tee. Sounds like your alignment sneaks to the right so when you “leave it right” you may be in fact making a pretty good pass at the ball. Develop a “vanilla” shot. One that either goes straight or only curves in one direction or the other. This is a big key to scoring better. comments: What is the typical clubhead speed of a touring professional? Male and Female? Thank you.